Sat, February 2, 2019 10:00 A.M.
Join us for a hands-on, interactive, Indian vegetarian cooking demonstration! Masala Meals will teach you how to make a delicious dosa! 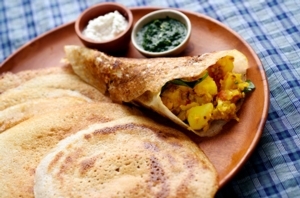 Dosa is a classic South Indian meal and a traditional dish served at family brunches! It is a rice and lentil crepe that comes in 30+ varieties! They'll be teaching you how to create a simple version and also have other versions available to eat from their homemade fermented batter. You’ll also be making your own simplified version of the traditional Samosa! Come with an appetite! You will enjoy generous tastings of all the food prepared. We will also serve a warm beverage and dessert. All participants will also receive sample MasalaMix spice blends. A discussion of health benefits of Indian plant-based cooking and various Indian spices will also be held. The meal can be vegan friendly. Tickets are available on Eventbrite. The Masala Meals team includes a mom and her two daughters; Vidya Saligrama, a home cook for over 30 years; Dr. Madhuri Sharma, a family medicine physician with a passion to use food as medicine, and Viba Saligrama, a healthcare consultant. For more information about Masala Meals visit www.cookmasalameals.com.